As you probably just saw, I posted a super cool lady in a lively, color-saturated frock. I just imagined someone coloring her outfit in the most vibrant hues possible, making the colors pop against the grit and grey in NYC. 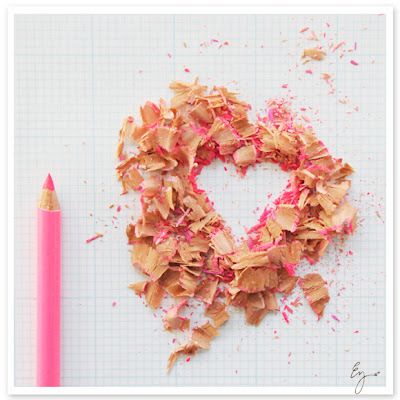 Then I began wondering how artists, fashionistas, and crafters use colored pencils (is that weird to think about? Kinda...I thought so). I am a born doodler- as a kid, I constantly filled reams of paper with comics and caricatures of my family. My medium of choice? Colored pencils: no muss, no fuss, and no obnoxious ink smears that stain my hand like I am some sort of swamp mutant. Gotta love 'em. Read on for some cool art and design surrounding this artsy must-have! Australian artist GhostPatrol thinks outside the box, and I like that. 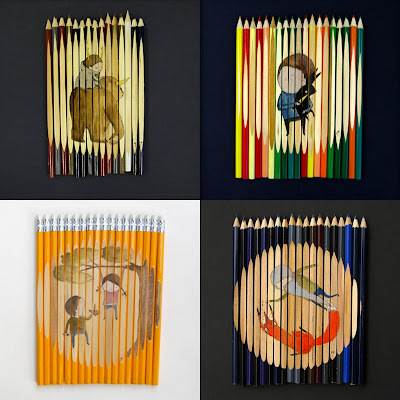 Instead of just taking a pencil to paper like most artists, he uses the pencil as both medium and canvas. 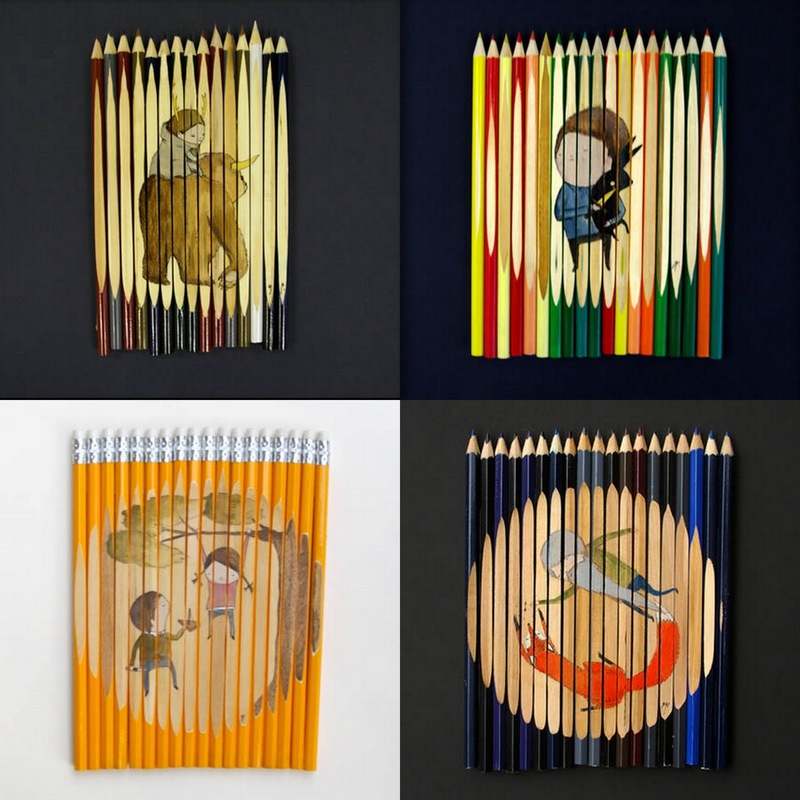 I think these would be super cute hung in an office nook, or in a bedroom for little kiddos. 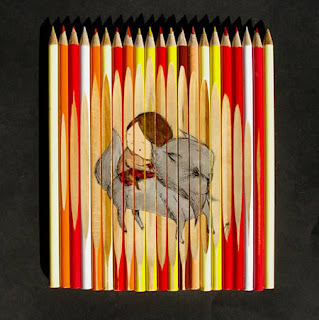 Each pencil creation fetches upwards of $2,000, so perhaps this one just might be tucked away in the "inspiration" folder for a while longer.....ok, who am I kidding....more like forever. So, in the spirit of these artistic delights, I found this DIY project to inject this same type of look into your home on the cheap. A beautiful pencil shelf to hold trinkets and doodads...just try not to poke an eye out. 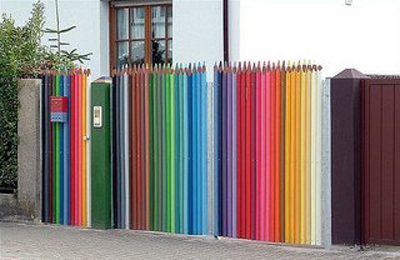 And this fence is just too cool for school. Calvin Klein took fashion illustrations in colored pencil and translated it to an awesome ad campaign (an oldie but a goodie!). 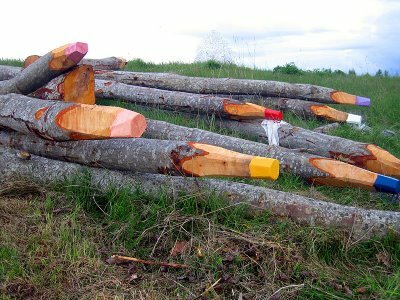 Artist Jonna Pohjalainen dressed up a pile of enormous aspen trees in rainbow bright colors..how excited would you be if you came across this on a hike? Ummm in one word....very. 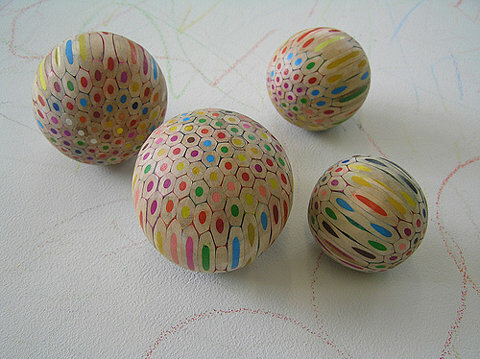 And these orbs made of colored pencils would look cute clustered together on a mantle or sideboard.